For a Limited Time, receive 2 - 5.5" Red Soft Wax Pads FREE with the purchase of this kit! 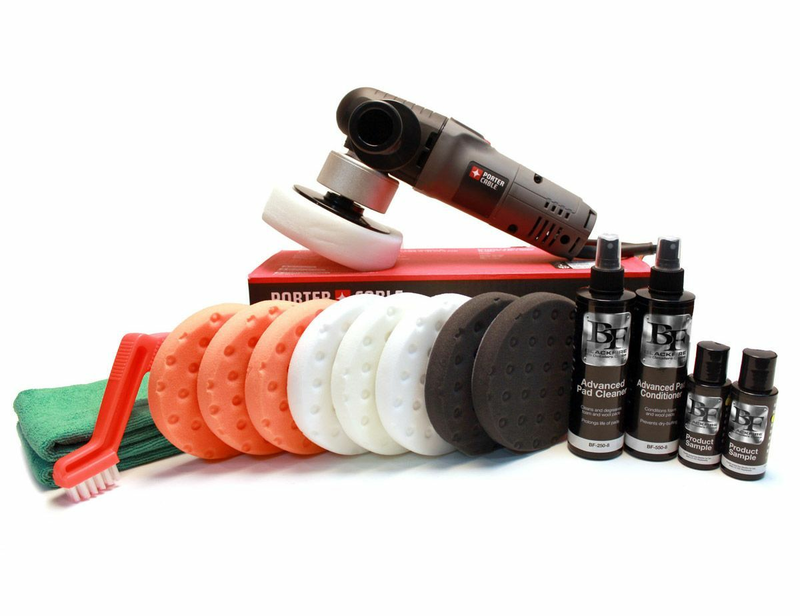 Remove swirls and scratches, polish away oxidation, and restore a deep gloss with the Porter Cable 5.5 x 7/8 Inch CCS Foam Pad Kit. The small, slim foam pads are very effective on ceramic clear coats and conventional clear coats. Use them with the Porter Cable 7424XP to maximize its paint correction ability. The firm, high density orange foam is ideal for scratch and defect removal. Use this pad with polishes and swirl removers. It�s an all around pad that will work on most light to moderate imperfections. This pad has soft composition for applying glaze, finishing polish, sealants, and liquid waxes. This pad provides full contact with paint surface to minimize the pressure applied by the user. These versatile microfiber towels are great for any variety of detailing tasks, from general washing and scrubbing off road contaminants, to applying and buffing off wax and all-in-one protectants. All the Cobra Detailing Towels boast an 80/20 polyester/polyamide blend in a special �feather� weave that increases their absorption properties, guaranteeing high performance and durability. The Edge Foam Pad Conditioning Brush removes excess, caked polish and restores the usable texture to your foam pads in seconds. An angled handle and textured grip give you excellent leverage as you press the brush against a spinning pad. Don�t stop working � clean the pad and keep polishing! BLACKFIRE Compound was developed using the latest German technology for OEM applications. It removes up to 1200 grit sanding scratches on fresh paint and an impressive range of imperfections from cured paint finishes. Application is user-friendly with a dual-action orbital or rotary polisher. BLACKFIRE Compound is the first step in creating a head-turning shine on neglected finishes! A total retail value of $288.83 Save $38.84! Additional discounts are not applicable on this item. Please call 877-855-3125 for an expedited shipping quote on this item. Works great and has planty of accessories. Love hte product. ProsI liked the way the kit package had everything in it without needing to buy more products. ConsI haven't used it enough to say.